Short Info: Apply online for 130 trade apprentices positions in Department of Atomic Energy, IGCAR, Kalpakkam, Tamil Nadu. Online application for 130 vacancies is invited by the Indira Gandhi Center for Atomic Research on 10 April 2019 from 10:00 to 24 April 2019 up to 05:00. Indira Gandhi Center for Atomic Research, Kalpakkam, Tamilnadu (IGCAR) has published a recruitment notification (01/2016) on 04/04/2016. The notification is for the recruitment of Trade Apprentice. 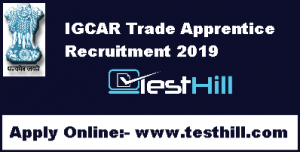 Here you will find complete information about IGCAR Trade Apprentice Recruitment Online Application Form 2019. You can check complete information about the IGCAR Trade apprentice application fees, age limit, eligibility, number of vacancies, application process, important dates, pay scale and important links. If you have any doubts about the IGCAR Trade apprentices recruitment online application form process, you can ask us through the comments form below. Department of Atomic Energy (DAE) – Indira Gandhi Center for Atomic Research is going to appoint qualified applicants for trade apprentices positions in various disciplines. It invites online applications from eligible candidates for the above positions. Applicants who want to get the job of central government in Tamil Nadu can use this opportunity. According to the IGCAR Kalpakkam recruitment notification, 130 vacancies are allocated for the recruitment of trade apprentices completely. Eligible candidates can apply in this recruitment from 10.04.2019. The IGCAR recruitment applies to online links and the notification is available on the official website. The last date for submission of online application is 24.04.2019. IGCAR Kalpakam will conduct an interview for the selection of suitable candidates. After that, the selected applicants will undergo trainee training in IGCAR Kalpakkam. Candidates will be selected on the basis of wages. Applicants should have passed 8th / 10th / ITI in relevant subjects from recognized board or institute. The candidate should get the prescribed age limit and rebate. Candidates will have to register themselves on the Apprenticeship Portal www.apprenticeship.gov.in. More details of IGCAR Kalpakkam jobs, latest vacancies, upcoming vacancies, job vacancies for the freshers, qualification list, selection list and etc. will be uploaded on www.testhill.com. IGCAR Various Posts Trade Apprentice Recruitment 2019 Online Applications will be available from 10th April 2019 to 24th April 2019. If you are interested in participating in the Indira Gandhi Center for Atomic Research recruitment campaign, see Important Dates related to this IGCAR Trade Apprentice recruitment 2019. Candidates who have completed their 10th standard examination and they are receiving ITI certificate in the respective stream, they will be eligible for this recruitment.